We all have our stories—some of them are long, some are short—and we all have our graves. Thus 150 years ago today, one of my favorite stories from the Civil War ended on the Kennesaw Line, that being the life of Col. Frederick Bartleson of the 100th Illinois Infantry. I came to know Fred many years ago through a friend who was one of his descendents, Mike Bubb. Bartleson’s story caught my attention due to his hopeless one-regiment charge against Longstreet’s juggernaut at Chickamauga. However, there was more to him than that one chapter. Frederick Bartleson was born in Cincinnati, Ohio in 1833, but grew up in Brooklyn, NY, and Freehold, NJ, where his father edited the Monmouth Enquirer. Fred had a good education and graduated from Alleghany College of Meadville, PA, with a degree in law and passing the bar at the age of 22. He traveled west to Joliet, Illinois to practice. In Joliet he quickly became a popular citizen, known for “his sterling qualities of mind and heart.” Fred was elected district attorney and married Kate Murray. While he was in Joliet recovering, another unit was being formed in the county, the 100th Illinois. 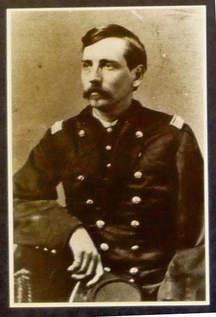 Bartleston was given command of the regiment, and when they departed for the front, their one-armed colonel led the way. The 100th first saw service in Kentucky, but missed the fighting at Perryville, instead having their baptism of fire at the battle of Stones River as part of the Union defense of the Round Forest. After the fight, Bartleson and his men were noted for their good conduct in the severe fight. The battle of Chickamauga would see hard fighting for the 100th. Then, in a desperate moment, Bartleson ordered his regiment to charge a force of unknown size in the woods just east of the Brotherton Farm. The force proved to be the entire Confederate left wing—more than 30,000 men who had just began a juggernaut assault into a gap in the Union line. The following fight was quick, brutal, and ended with expected results. Many men of the 100th, Bartleson included, were sent off to Confederate POW camps. Bartleson was held for six months at Libby Prision in Richmond, before being exchanged and given leave to return once more to Joliet in the spring of 1864. While home once more, he was again urged to resign and enter politics. “I want no nomination, and no office but the one I know hold,” he replied, “and I shall return to my post and give my life if need be, to secure to us a free government.” Bartleson then returned to his regiment jus in time to enter the field with it for the Atlanta Campaign. Thus ended the story of Col. Frederick Bartleson, joining the ever-growing list of talent on both sides that were falling in the constant war of sharpshooting and long-range artillery fire. This entry was posted in Campaigns, Common Soldier, Leadership--Federal, Western Theater and tagged 100th Illinois Infantry, Atlanta Campaign, Battle of Chickamauga, Frederick Bartleson, Kennesaw Line. Bookmark the permalink. So interesting thanks so much! What a great man! The question as to why Bartleson charged at Chickamauga on the 20th has arisen on several occasions. In minutes of an annual report of a reunion of the 100th several of the former officers are referenced as stating that they distinctly remember an officer from General Wood’s staff riding into the regiment an ordering Bartleson to investigate a masked battery observed on the edge of the woods to his front. Needless to say, the controversy that was to follow over the “Fatal Order” between Woods and Rosecrans overshadowed any such details that may have involved a regiment. For more interesting details on Bartleson’s leadership is a study of the Battle of Latimer Farm. Just after his return from Libby he led the brigade through a blinding thunderstorm driving the Confederate forces out of the Mud Line and back to positions on Kennesaw. I think it is a little ironic that while most of the battles in which the 100th fought are usually covered in detail the one where they played the most seminal role is largely overlooked. Helping turn Cheathem’s cavalry at Spring Hill.